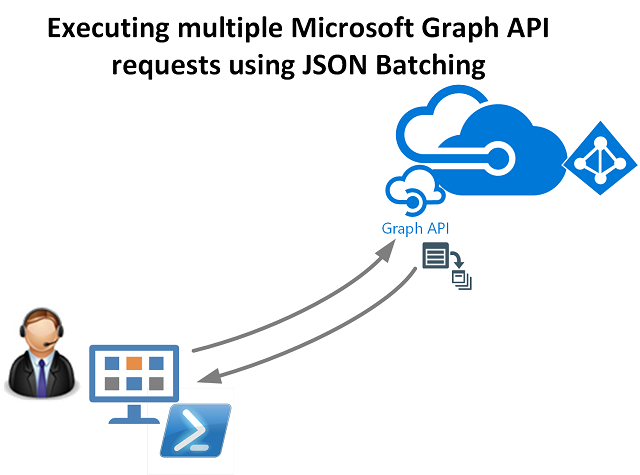 Late in 2018 it came to my attention new functionality with the Microsoft Graph API for batching API requests into a single request. As I predominantly use PowerShell for scripting into Microsoft Graph parallel requests historically required extra functions to achieve something similar. Use of Invoke-Parallel for instance, that I’ve previously discussed in posts such as How to create an Azure Function App to Simultaneously Start|Stop all Virtual Machines in a Resource Group. Fast forward to 2019 and I’ve been building a bunch of reports from Microsoft Graph that aggregate data from multiple API endpoints such as /users /auditLogs and /security . A perfect time to explore deeper JSON Batching with Microsoft Graph. … with your request in the body that includes the suffix for the API URI for the request, the request method and an ID. The example below is to query the User API endpoint for users whose displayName starts with the string provided. Additional requests are added as required to build the Request Body and passed as part of the Post request to the Batch endpoint. Each additional request in the batch requires a different ID and the respective particulars for the request(s). Below is an example for generating a batch in PowerShell with two requests. The responses come back under the Responses property as shown in the graphic below. The responses have the ID of the requests associated with them so you can associate a response with a request. The request responses can then be parsed by iterating through the jobs. Using Microsoft Graph JSON Batching we can submit multiple requests as a single job, have the requests performed on the backend in parallel and get the results back. Keep in mind that the request can also use the DependsOn option to make a request dependent on another that must be completed prior. Also if the response contains a dataset that is paged. Check the nextLink property on the responses and make subsequent calls to return the remaining data. how to implement the JSON batching?